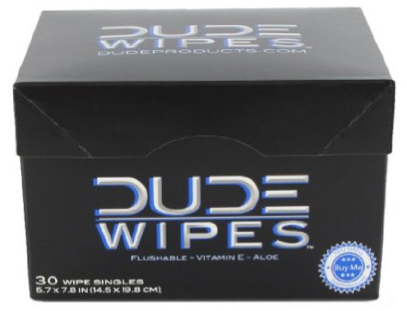 Ah, Dude Wipes. The wetnap for men too dainty to use toilet paper or paper towels, but too self-conscious to buy a box of actual baby wipes. At $10 for 30 wet-wipes, that red-faced, ear-burning shame you feel when you grab a couple of pre-moists from a box with a baby on it had better be pretty strong. Guess what, scared guy, we were all babies once, with poop on our balls, and the baby wipes worked fine. Swab your poopy balls with the baby box and move on with your life. Or do what I do after I take a monster D. Garden hose in the summer, old scarf in the winter.